The North American P-51 is one of the most iconic aircraft of WWII and as such needs no introduction here. Information is available in legion from both printed matter and the internet so I'm not going to waste bandwidth here. The kit represents the -5NA version which was an early variant and lacked the dorsal fin which was added to later versions to compensate for the loss of keel when the rear fuselage was cut down for the bubble canopy. Some early models had this fin retrofitted. 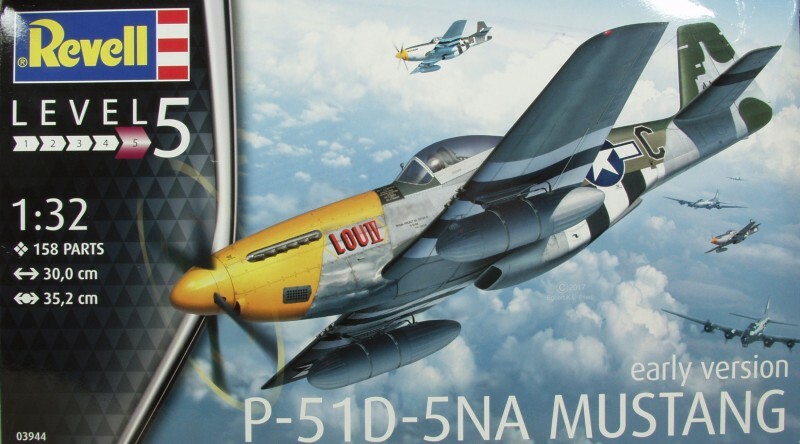 The Revell P-51D comes in a large end flap style box that everyone loves to hate. Inside the box the sprues are divided into four groups, each in their own separate bag. 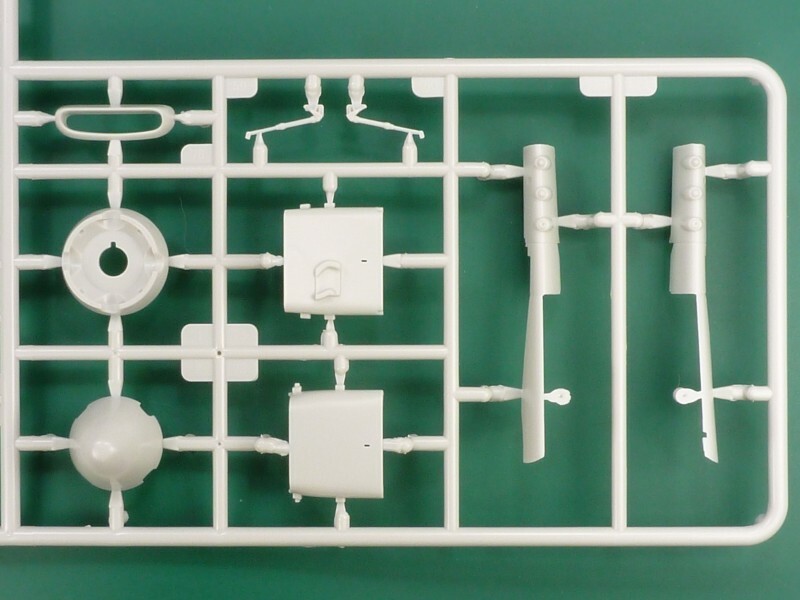 The kit is molded in a light bluish green color. Overall the parts are crisply molded with only a hint of flash. That said in a few areas the detail is a bit softer than might be seen on a Tamiya kit but still quite acceptable for most. 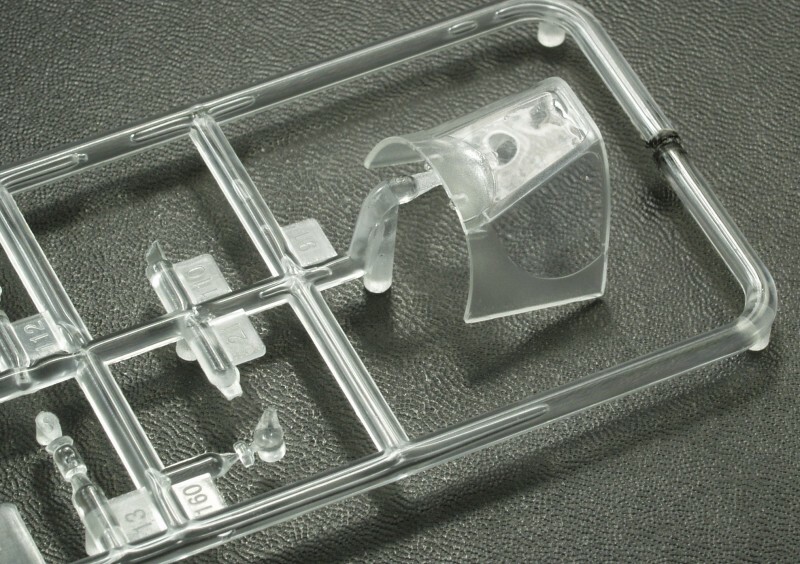 Mold alignment is good and there is only a minimal amount of mold work to clean up on parts. Surface detail is provided with recessed panel lines with a minimal amount of recessed rivet and fastener detail. The panel lines are consistent and a good size for the scale. 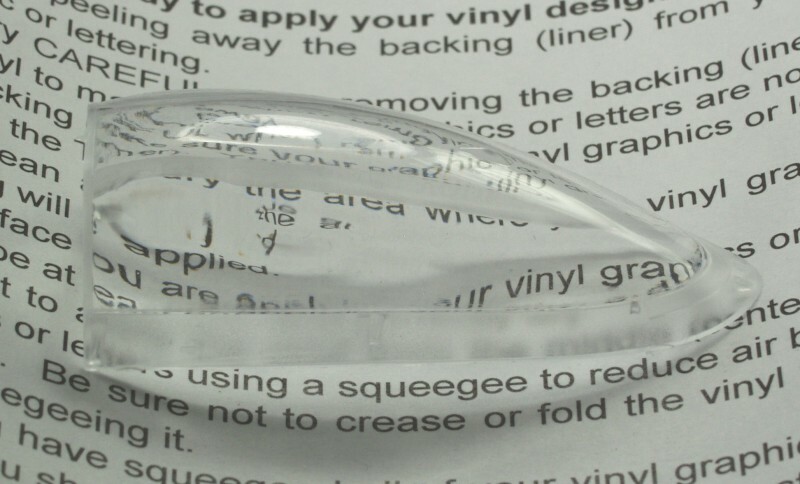 The surface of the parts is smooth and has a matte finish. There are a few surface anomalies such as a light sink mark that runs down the center of the flaps. This seems to vary some from kit to kit as mine weren't as bad as some others I have seen. The fuselage is broken into two halves which indicates that a some point a later model with the dorsal fin will be released. The control surfaces are molded separately and can be posed in positions other than neutral is desired. Unless I have over looked something it appears that all ejection pin marks have been located where they will not be seen. No separate service panels have been molded but the air intake on the front cowling has been molded separately and you have a choice of the three different styles that were used. I understand that the louvered panel was only used on British Mustangs. The fabric surfaces are nicely represented and not over done as seems to be common. Enough verbiage lets look at the parts. 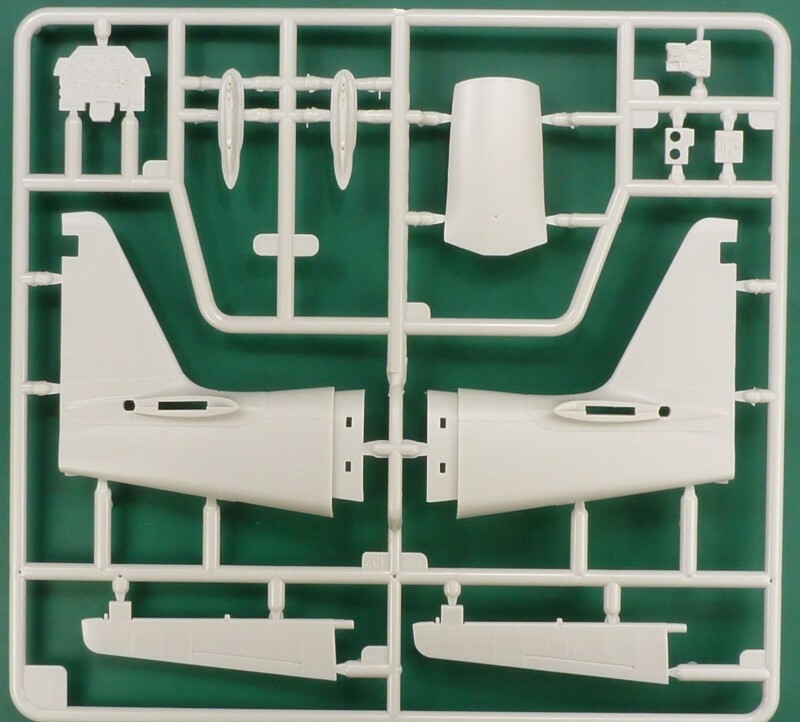 The first sprue contains the forward fuselage halves, main gear struts and tail wheel strut some cockpit details and the various nose cowl panels. The inside of the fuselage only has a small amount of structural detail as most of this will be added during assembly. There are two rather large ejector pin marks in this area but they should be mostly covered by the add on side wall detail. 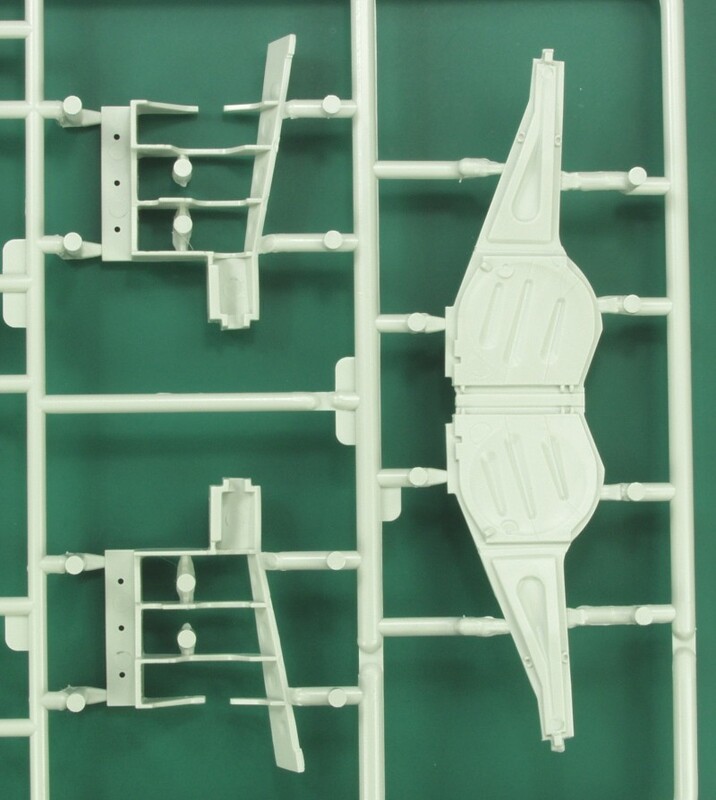 The next sprue contains the rear fuselage halves, one piece molded elevators. the instrument panel and center console, two under wing racks, and a panel that covers part of the lower nose. Here is a close up of the molded on detail of the instrument panel. I have divided the next sprue into two parts as it is the largest one. Lots of stuff here, the one piece prop, two sets of flaps, one for up an one for deployed, two different styles on cockpit cowls, cockpit parts including the seat and rudder pedals, exhaust shrouds, and belly scoop parts. 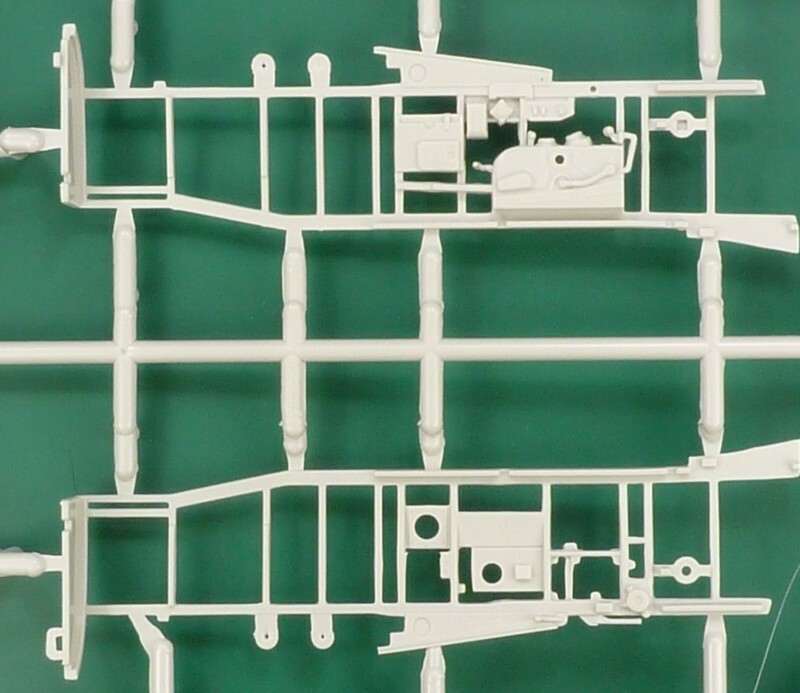 The other portion of the sprue contains the separate forward wing leading edge near the gun ports. The guns are represented by one indentation and two gun barrel stubs. An area that would benefit with some extra detail. Also located here are more belly scoop parts. Upper and lower wing halves. There are some holes to drill in the bottom wing as well as a number of small indentations not used that will need to be filled in. The upper wing half features structural detail on the back side for the gear bays. 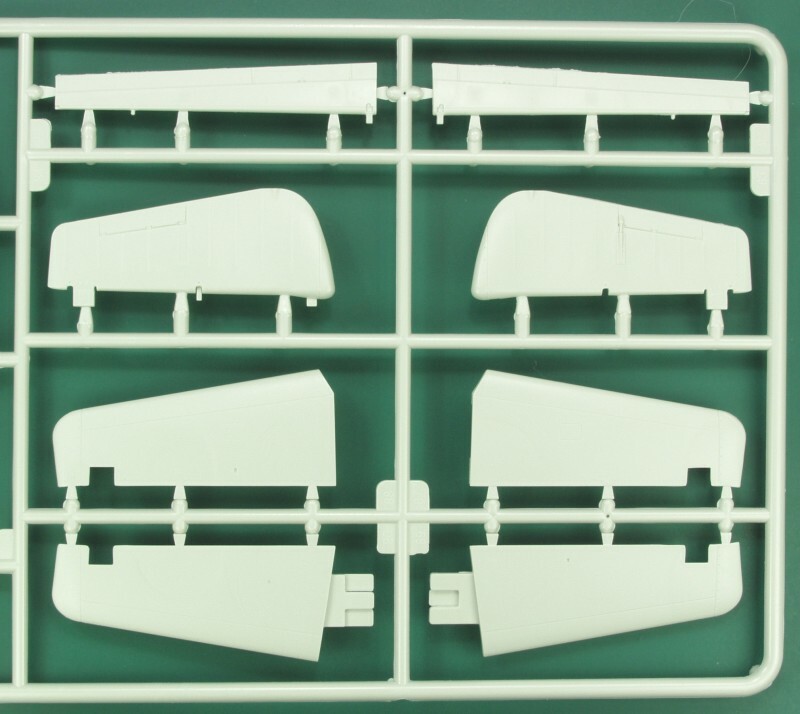 The next sprue contains a lot of structural parts, the main wing spar, main gear bay structure bulk heads, parts for boxing in the tail wheel bay, the fuselage nose cap, bulkheads and the main gear doors which need to be cut apart when displayed in the lowered position. A close up showing the detail molded into the inside of the main gear doors. 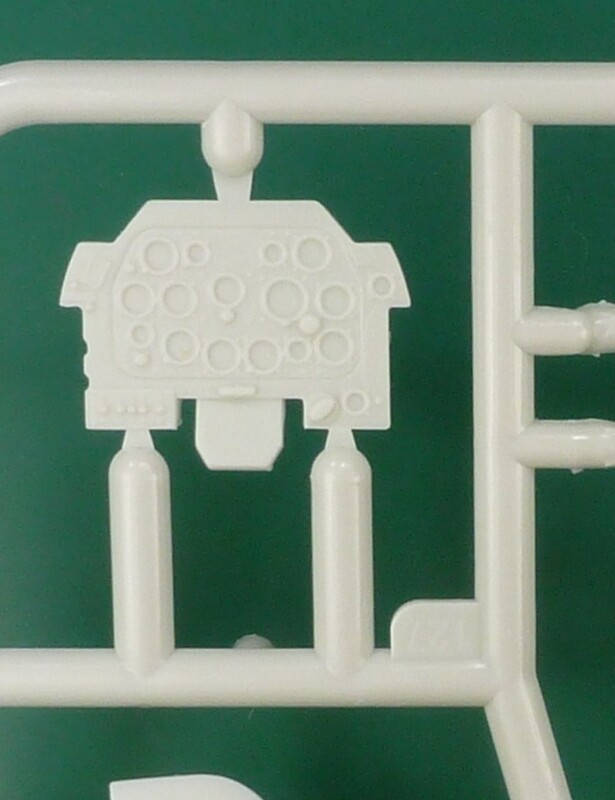 The next sprue I also split up to better show the detail. The first section has the cockpit floor, a section that becomes the belly cooler ducting and tail wheel bay and the left and right cockpit walls. A closer view of the wall details. 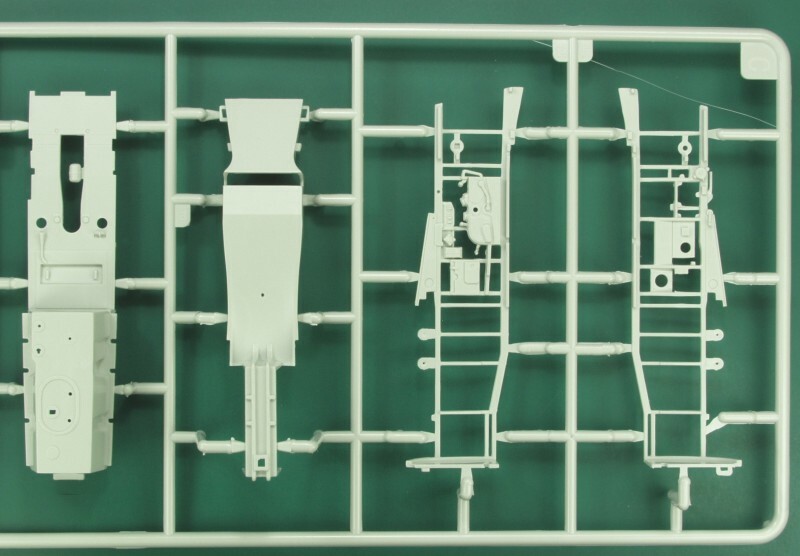 The other part of the sprue contains the rudder in two halves, single piece ailerons and the upper and lower horizontal stabilizers. 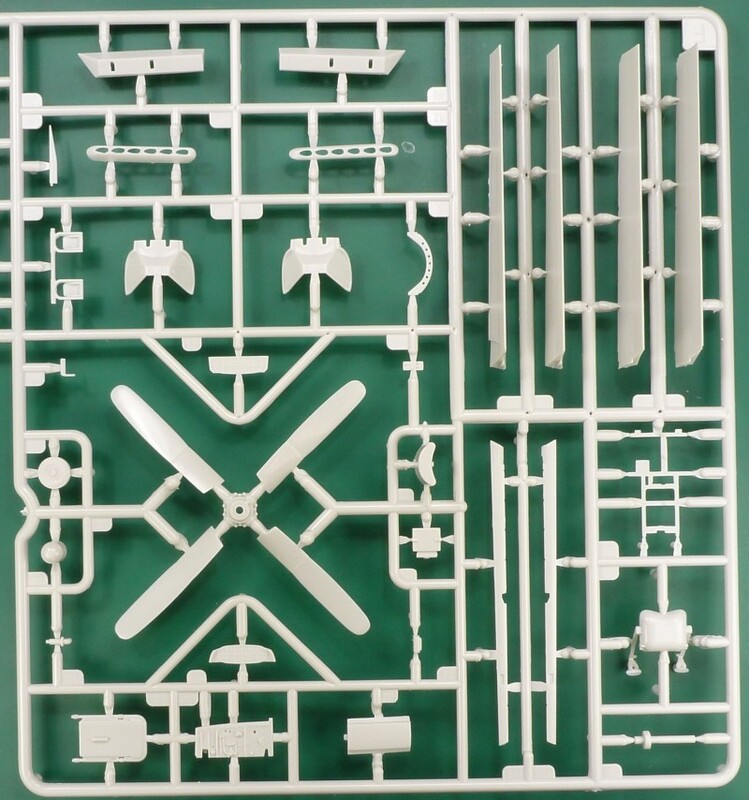 The last sprue of which there are two, contain a bomb with fins and mounting gear, exhaust stacks, main gear wheels, radiator cores and two different styles of drop tanks. The clear parts are the most disappointing part of the kit, both the bubble canopy and the forward wind screen are very distorted which can be seen below, the one in my kit almost looks as if it has a blister molded on one side, the wind screen, although nice from the standpoint it is molded with a portion of the fuselage to make seam filling easier is just as bad. So if you want to have a good look at the interior detail one must find a substitute or leave the canopy open. Some folks have requested replacements from Revell and the new parts were better if not great than the ones in my kit. I was able to source a Tamiya canopy which will fit this kit from eBay. 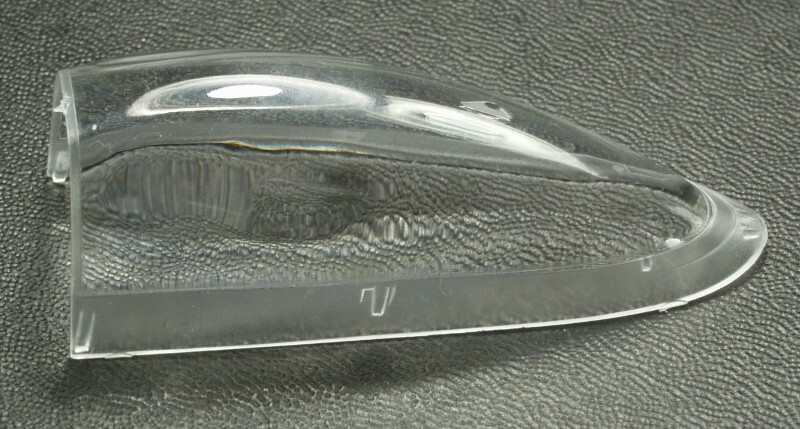 The other clear parts are a gun sight, formation light covers, wingtip light covers and landing light. The decals are very nicely done and though it doesn't say who printed them it does say they were printed in Italy so Cartograph is a likely suspect. 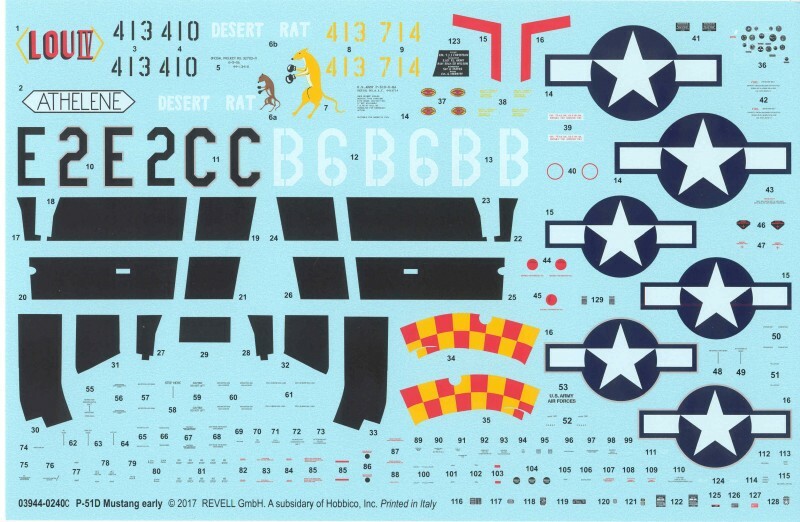 The sheet provides markings for two aircraft, the rather well known Lou IV and the Desert Rat. The printing and registration are excellent and a great number of stencils are provided although not all are called out to be used. A variety of placards are provided for the cockpit as are Hamilton Standard logos for the props. The decals are opaque, have a flat finish and have minimal excess clear film except for the code letters which are almost always better trimmed down anyway. The instructions follow the trend to an extreme almost. It's a 24 page booklet, stapled at the spine and printed in color. The instructions provide no aircraft information although a brief description is listed on the side of the box. The front page features a photo of the completed model and has a note at the bottom of the page referencing a separate safety warning sheet listed in 21 different languages. Page 2 has what is referred to as "additional tips and tricks" shown graphically and pages 3 and 4 feature an Icon chart with each icon being described again in 21 languages. Pages 5 and 6 are a color chart referencing Revell paint numbers which also feature generic names in 21 different languages. Some of the colors require mixing and percentages are given for those. Pages 7 and 8 feature a parts map and a note as to where spare parts may be obtained in Germany and Great Britain. Assembly starts on page 9. Paint color call out are abundant and many of the parts are shown in the color they are to be painted. Assembly continues through page 20 in 74 steps. Pages 21 through 24 are the main painting and decal instructions. All in all a very nicely done booklet that should be easy to follow. 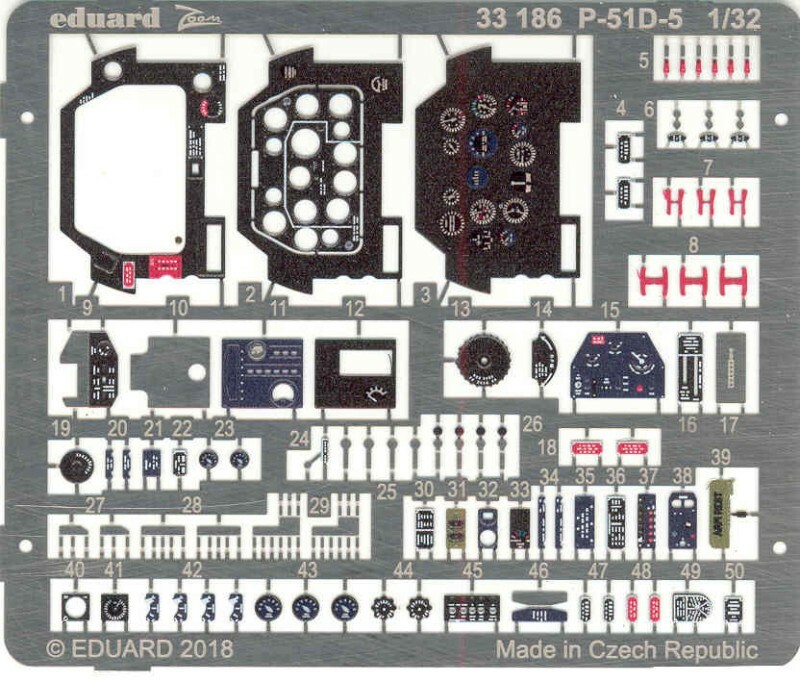 There are a number of after market items available for this kit but so far I have only acquired the Eduard Zoom set shown below. This is one of their newer style instrument panels which is more finely printed and features a dome of clear material over the instruments themselves which save one the need to do it yourself. A competitor Yahu has been selling instrument panels with much better detail which no doubt gave Eduard some reason to improve on theirs. Typical of the Zoom sets it also includes some additional cockpit details but no seat restraints which means buying and additional item if you want them. This kit provides a nice alternative to buying the more expensive kits from Tamiya or Zoukei-Mura. For the price of one Tamiya kit you could buy four of these. That said one can forgive some of the faults found in this kit. It is certainly a much simpler kit having no engine or detailed gun bays or opening or removable panels and for those who aren't interested in such things all the better. The biggest downside to the kit is the poorly executed clear parts. At this date no after market supplier has released any replacement canopies although I suspect at some point someone will. 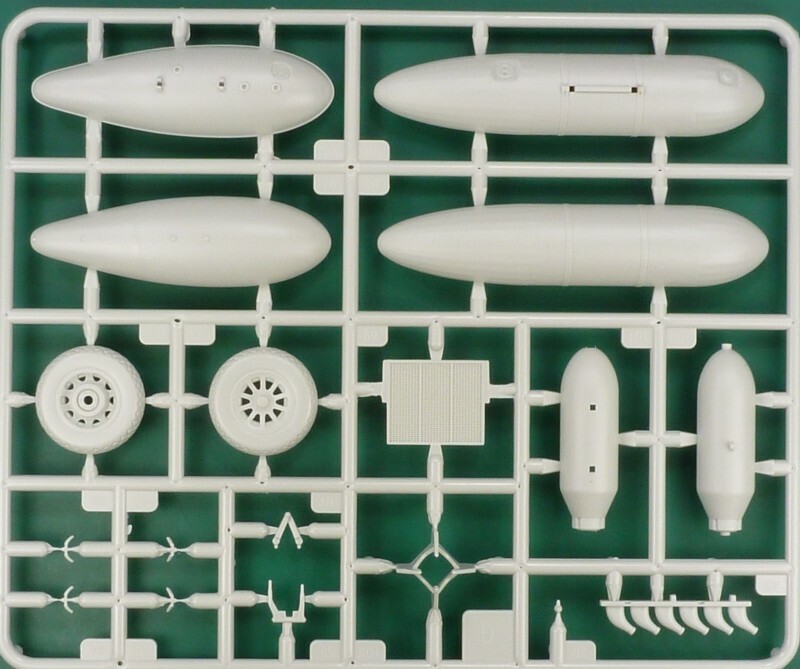 An alternative is to find someone who has built the Tamiya kit and used the late style canopy as the Tamiya kit includes both the early and late versions. Beyond that the kit has no major faults and those that exist are easy enough to fix using normal modeling skills. The kit provides a nicely detailed cockpit right out of the box and overall is a much easier build since it contains a lot fewer parts. In box reviews here and here . As I mentioned early references for the P-51 are numerous and much is available on the internet.